The new restriction comes as a Kurdish-Arab alliance of fighters nears Raqa, backed by the US-led coalition launching air strikes against IS. 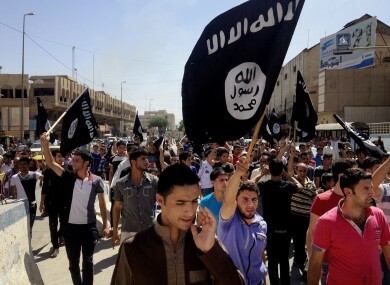 File photo of pro-IS demonstrators in Mosul. THE ISLAMIC STATE group has imposed an “Afghan-style” dress code on men in its Syrian stronghold Raqa to help its fighters blend into the civilian population. “For more than two weeks, Afghan-style clothing… has been imposed by Daesh,” said Abu Mohamed, an activist with the Raqa is Being Slaughtered Silently group, using the Arabic acronym for IS. “Anyone who does not comply faces prison and a fine,” he told AFP. The rule “is an attempt to make it harder for airplanes and the Kurdish forces… to distinguish between civilians and Daesh members,” Abu Mohamed said. The Syrian Observatory for Human Rights, a Britain-based monitor of the war, also reported the new rule in Raqa. “The Islamic State has imposed Afghan-style dress on residents of Raqa so that informants giving coordinates to the US-led coalition will not be able to distinguish between civilians and fighters,” Observatory director Rami Abdel Rahman told AFP. Abu Mohamed said there was a “state of alert” in Raqa, with new checkpoints springing up and IS arresting anyone who describes the situation as dire. “Prices are skyrocketing and there is no electricity or water,” he told AFP. The Observatory also said civilians and the families of IS fighters were attempting to flee into Raqa province from neighbouring Aleppo, where IS is under assault in the east. “Thousands of families in recent days have tried to reach the administrative borders of Raqa province, along with around 120 families of fighters and commanders of IS,” the monitor said. The Kurdish-Arab Syrian Democratic Forces alliance advancing towards Raqa on Monday cut a key supply route between the city and IS-held territory in Deir Ezzor province to the east. The alliance is now eight kilometres (five miles) from Raqa to the northeast, according to the Observatory. It said IS was preventing civilians from entering the province “but granted families of its fighters” a document allowing “passage to Raqa city by boat as ground transportation is now impossible because the bridges across the Euphrates have been destroyed”. Email “Islamic State imposes dress code on men in captured city to allow its fighters blend in”. Feedback on “Islamic State imposes dress code on men in captured city to allow its fighters blend in”.